The Emerald Downs grandstand features three EAW KF730 line arrays installed in the previous loudspeaker locations providing complete coverage. 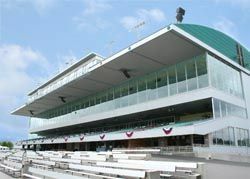 EAW MQ Series loudspeakers installed on the roof supply additional coverage to the paddock and track viewing areas.SEATTLE, WA-Opened in 1996, Emerald Downs furthers a rich heritage of thoroughbred racing in Washington state dating to the early 1930s. But low-frequency performance had become intermittent, and overall coverage was inconsistent, to the point where patron complaints had become an ongoing fact of life recently. Track management decided it was time to replace the original sound reinforcement system serving all outdoor areas. Management stipulated that, if at all possible, the three existing loudspeaker bays be utilized as the positions for new loudspeakers. This pointed to loudspeakers able to achieve the necessary throw and focus despite location limitations. Seattle Pro Audio, who was brought on to formulate new design approaches, also envisioned a simple, sleek package fitting the aesthetics of the venue. "All of these factors led us to seriously investigate a line array approach," explained Walter Lucas of Seattle Pro Audio. Following on-site evaluation of several loudspeaker candidates, the system team agreed upon EAW KF730 small line array modules as best meeting all of these factors. Each array at the three positions is comprised of six KF730 modules formed into a gentle "J" array shape. The bottoms of the arrays are then pulled back considerably to optimally align them with the slope of the grandstand seating. Steve Malone, head of Seattle-based Malone Engineering, managed the system installation process, including flying and securing the line arrays. Using rated chain and shackles, he was able to correctly position the arrays despite the limitations of the existing infrastructure, particularly at the center array location that is further complicated with a trapdoor. Seattle Pro Audio's Walter Lucas at the system's Allen & Heath iLive digital console. The other key aspect of the new system is a tandem loudspeaker approach to cover the expansive paddock and audience area extending far down the track. Two EAW MQV Series high-output installation loudspeakers were mounted atop the grandstand roof, with one handling the paddock and the other covering the audience area. Further out, EAW AX Series loudspeakers mounted on lighting poles extend coverage the rest of the way.The system also features a new mixing console installed in the main control room on the ground level of the grandstand. The Allen & Heath iLive-144 digital board handles up 70 inputs from a wide range of audio sources at the track. All 32 mix outputs of the companion A&H iDR10 mix-rack are in use, and the programmable nature of the iLive surface allows configuring the different mix outputs to provide feeds to the grandstand, boxes, hospitality suites, clubs, broadcast trucks, other broadcast feeds, and monitor mixes.